What is Helicobacter Pylori Breath Testing? Helicobacter pylori (H. pylori) is a spiral-shaped bacterium that infects more than 30% of our global population. H. pylori Breath Testing is a diagnostic tool that detects whether or not you have a current H. pylori infection. H. pylori invades the mucosal stomach lining and can cause inflammation of the stomach (gastritis), which may lead to duodenal and gastric ulcers. Research shows that H. pylori infection contributes to the development of gastric cancer and lymphoma. H. pylori C14 Urea Breath Testing monitors the activity of urease, an enzyme produced by the bacterium. Urease is critical for H. pylori to survive in the strong acid environment of the stomach. Urease converts urea to ammonia and carbon dioxide, reducing the acid level of the stomach fluid. If you’re infected with H. pylori the test will detect carbon dioxide from this chemical reaction in your breath. More Info. 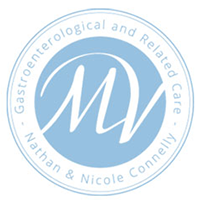 Patient testing for H. pylori is performed in the comfort of Moonee Valley Specialist Centre. It’s simple, accurate and non-invasive. Plus your test results are available straight away. Why do I need H. pylori Breath Testing? If you’re experiencing burning pain in your upper abdomen, nausea, vomiting, burping, indigestion or loss of appetite, testing for H. pylori infection may be conducted by Moonee Valley Specialist Centre. H. pylori can infect your stomach lining and lead to serious disease. Sadly, gastric adenocarcinoma is the second highest cancer-causing death in the world. Compared to gastroscopy for biopsy samples, blood screening or stool testing – testing your breath for urea, using this quick and accurate procedure in the Moonee Valley Specialist Centre clinic, is both convenient and informative. If you are infected with H. pylori Moonee Valley Specialist Centre will prescribe first-line antibiotic and acid suppressing therapy to eradicate H. pylori and prevent ulcers from recurring. Some patients have a persistent infection, as indicated by urea breath testing, and require second line and additional therapies to successfully eradicate the infection. For more information about H. pylori Breath Testing and treatment, click here or contact us with your questions.